Daniel has worked at the museum for three years. 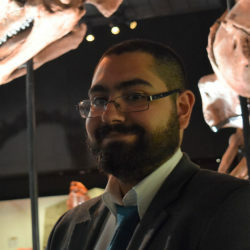 Despite a background in the arts, he has had a fascination with zoology and paleontology, his specialty, since he was a child. While he enjoyed superheroes and robots like other kids growing up, one of the other things he also enjoyed over the years were documentaries, books, and films about animals and dinosaurs. He has also begun to take up a fascination with anthropology in the more recent years, and hopes to continue pursuing it, and all the aforementioned subjects, for all the years to come. When he is not giving tours, he can be seen helping guests around the museum or walking through the halls to learn more about them.